Four rare shows from the Golden Age of TV anthology drama, all with big Hollywood stars! ERROL FLYNN THEATRE "RESCUED" (1953): When an English Lord is captured by enemies of the King, heroic Captain Morton (Errol Flynn) and his men come to the rescue. 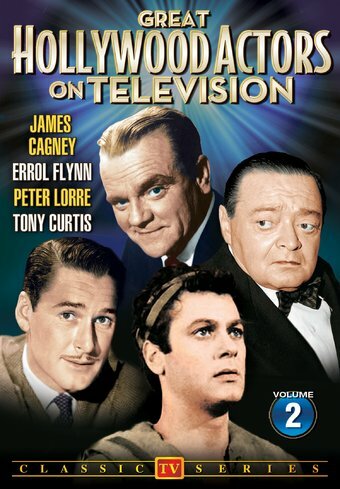 Errol Flynn Theatre was shot in England for the American market, with each episode featuring the iconic leading man in a different role. Co-star Andrew Keir played Professor Bernard Quatermass in Five Million Years to Earth (1967). THE CHRISTOPHERS "A LINK IN THE CHAIN" (1957): James Cagney made his first appearance on television in this episode of the religious program The Christophers. Cagney plays a college professor on the verge of retirement who believes he's accomplished nothing with his life. Through a series of flashbacks, we are shown just how much of an impact he really had on his students' lives. The Christophers TV series began on ABC in 1952, and still airs on local cable stations to this day as Christopher Closeup.